Tonight I had the good fortune to go to the first live world premiere with a full choir and orchestral accompaniment with this great film at the South Bank Centre in London. I have come back very moved. 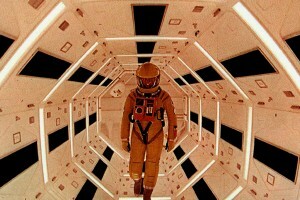 The original story by Arthur C Clarke was a short story, that was rewritten and lengthened encouraged by Kubrick. The story is mystical and fascinatingly mixes up science and spirituality. I used to think this film was the ultimate expression of modernity, but I had forgotten how it is laced with postmodern existential awe. The original story relates aliens as beckoning humans to evolve (the black obelisk encouraged humanity to reimagine what is possible) resulting in humanities evolving into star children – children of the light. I am fascinated how this holds deep premodern transcendence – spiritual searching – and the sense of human becoming. For me what the book expresses as aliens, the film seems to be more mystical – more about encountering the divine rather than an other species. The almost total lack of dialogue makes this sense of transcendence deeply felt. The ending of the film used to confuse me. Seeing it live – it now not only expresses a sense of evolution, but a sense of theosis – that humanity is transformed into an inseparable connection with the divine, following birth, life death and resurrection.